A contemporary arts festival that takes place in Kensington’s streets, parks and public places! The UK’s biggest outdoor painting festival takes to the pretty streets of Kensington and Chelsea over a weekend in July! In just one day, artists create a work (of any style, size and medium) that captures the spirit of the area – you can see the artists in action around the borough on the Saturday. The following day, artists exhibit their works at the Town Hall on King’s Road, allowing members of the public to see the finished items, meet the artists and also purchase the paintings. Nearly 400 artists took part in Pintar Rapido – meaning “painting quickly” in Spanish, where the idea originated – in 2013. If you’d like to take part in the event as an artist, you can find more information on the website above. Taking place over the last weekend of August, the Notting Hill Carnival gets bigger, bolder and better every year. In case you’re wondering, the Monday after that weekend is always a public holiday in the UK – so you can party hard with no work consequences! Read more about it on our sister site: Notting Hill Carnival. Every winter (November to January), a 1000 square foot ice-skating rink is created in the grounds of the Natural History Museum. Over the years, this pastime has increased in popularity in London during winter, and a number of rinks appear all around the capital – including some in very scenic locations (e.g. Somerset House, or the Tower of London). 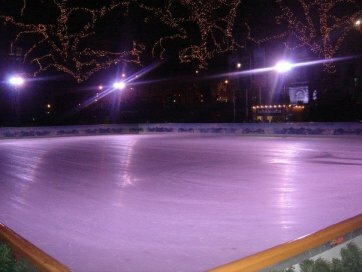 The rink at the Natural History Museum, although smaller than some others, is amongst the more established ones in London and is hence very popular. The excellent location and the beautifully decorated surroundings attract numerous visitors. There’s also a bar serving hot and cold drinks, food and snacks, plus the ultimate winter warmer – Winter Pimms. You definitely have to book in advance as tickets tend to sell out relatively quickly, and if you prefer not to skate amongst the crowds, try to go on a weekday afternoon. Alternatively, I’d recommend going in the evening to get the full effect of the atmosphere and the pretty fairylights twinkling in the trees. There’s also a little side rink for beginners or those wishing to brush up their somewhat rusty skating skills. There are also marshalls on the rink who provide tips, or help those that haven’t quite got the hang of it. And don’t worry, plenty of people fall down! Tickets can be bought online. Skates are provided at no additional cost to the ticket. See Ice Rink at the Natural History Museum for further details. This popular gift fair brings together over 60 quality exhibitors under one roof, selling quality fashion, jewellery, childrenswear, homeware, and yummy food & drink – the perfect place to pick up some lovely and unique Christmas gifts! Okay, technically outside the borders of Kensington and Chelsea, but as it’s on our doorstep, we’ll mention it here. This annual Christmas fair normally opens in late November and stretches through to early January. It’s actually free to enter, so you can have a pleasant stroll through the event, looking at the craft stalls selling their wares, enjoying the pleasant smells of the sweet treats and savoury goods, and watching people whizz around the ice rink and scream their way around the fairground rides. (And do obviously partake in any of these things or activities!) If you can, try to avoid the fair on the weekends on during the school holidays when it can get very, very busy.